For the planning of the system architecture of the centrifuge a 3-room-concept is required to realize the high requirements of the pharmaceutical industry with respect to hygiene, absolute cleaning and sterility. Hereby it you must be ensured, that in case of necessary repairs – and/or also refer to rules according to the regulations for prevention of accidents BGR 500 – components which are in need of repair can be replaced through the machine room, if possible. 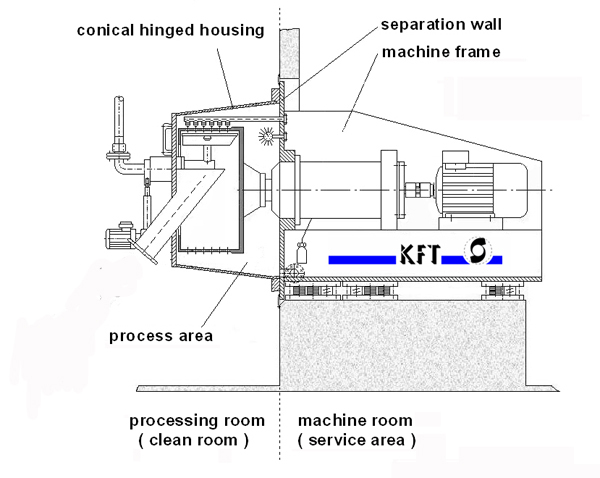 Generally all substantial requirements have to be made at all centrifuge components in the process and cleaning room. Dead spaces and difficult accessible positions, which can only be incompletely reached by the cleaning fluid, must be avoided. Liquid bags are not allowed and the liquid must be able to run out of all parts of the plant. Gaps and undercuts are undesired. It must be paid attention to the design of the seal technology. The process room has to be cleaned fully automatic monitored refer to the Cleaning-in-place or Sterilization-in-place method, if necessary. In this case it has to be ensured a sufficient wetting of all areas and corners of the centrifuge by the cleaning flow.